Keen to help but new to Kickstarter? Kickstarter is one of several crowdfunding websites. They provide a platform for creators to share projects with the internet. Anyone interested has the opportunity to become a backer. If a project meets its target within a fixed period of time (usually 30 days), then each backer’s pledge is collected by Kickstarter and delivered, minus a fee, to the creator, who then uses the funds to complete the project. 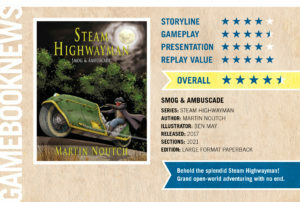 You can look at the Steam Highwayman project without having to make any commitment, but if you would like to back the project by contributing to the costs, you will need to create a Kickstarter account. This is quite straightforward and completely secure. When you back a project, you provide your card details to Kickstarter just as you would to any online shop or store, like Amazon or Ebay. You select the level of reward you would like to receive and can even select how much you would like to contribute. However, you aren’t charged until the end of the project, and then only if the target is met. If the pledges don’t reach 100% of the target (which the creator cannot change during the project) then the Kickstarter campaign finishes without any money changing hands. Kickstarter has an excellent platform for crowdfunding: it already has a strong community of backers who scout for projects that interest them. Self-publishers can reach a much larger, international audience through the website. Other types of projects are also suited to the platform: the board-gaming community have used Kickstarter to fund countless independent game publications that would never have been possible using traditional channels, igniting a tabletop renaissance. I’m keen to use similar methods to build a readership for my work and make it directly available. Kickstarter is also very successful at building communities around projects. I am looking forward to discovering new friends and readers who are keen to have an input into the project.